If you were wondering how to downgrade iOS 11.1 Beta to iOS 11 on your iPhone, iPad or iPod, then here’s how you do it. 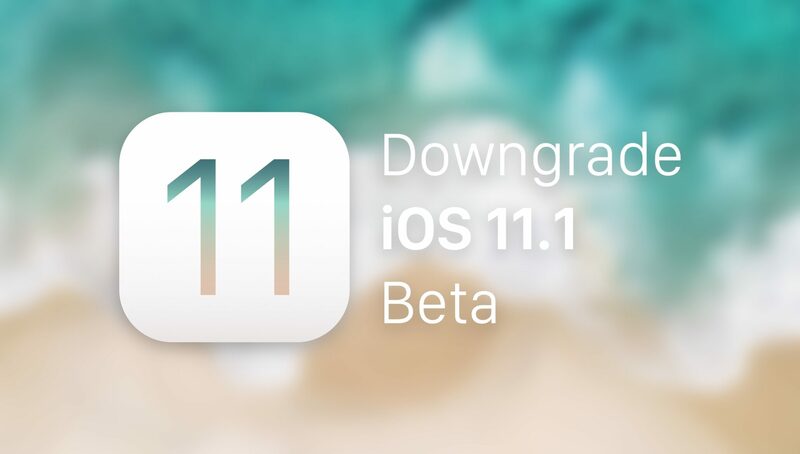 Downgrade iOS 11.1 Beta to iOS 11 Right Now if You Want Stability Back in Your Life. iOS 11.0.1 was released earlier this week, and Apple followed it up quickly with the addition of iOS 11.1 for developers and public testers. The update brings with it a bunch of refinements that is bound to improve the iPhone and iPad experience even further. But of course, we are dealing with beta software here which can prove itself to be unstable in certain corners. If you believe you have made a mistake updating to the firmware then you will be pleased to learn that you can downgrade back to iOS 11 or iOS 11.0.1 right away without much fuss. But the one thing you should know at this point extremely well is that the downgrade process will erase everything of your device, so make sure you have created a safe backup using iTunes or iCloud. Last but not the least, since Apple is signing iOS 10.3.3 even today, you have the option to downgrade to that firmware as well. Basically, you have multiple routes to follow, and which one you end up taking is entirely up to you. Remember one thing though – there’s no telling when Apple will stop signing iOS 10.3.3, therefore make your move quickly. Downgrade iOS 11.1 Beta to iOS 11. Update: iOS 11.0.3 is now available and Apple has stopped signing iOS 10.3.3. First of all, download the IPSW file of the firmware to which you you downgrading to. You can download iOS 11.0.1 from here, iOS 11 from here and iOS 10.3.3 from here. Make sure you download the right IPSW file otherwise iTunes will fail to restore it. 1. Connect your iPhone, iPad or iPod to your PC or Mac and launch iTunes. 2. Your device will show up in the top left hand corner of iTunes. Click on the little icon that looks like an iPhone/iPad to view more options. 3. Click on the ‘Restore iPhone’ button while holding down the left Shift key (Windows) or the left Option key (Mac). 4. Now select the IPSW file to which you wish to downgrade to. As soon as you do, iTunes will start extracting the firmware then restore your device. Once everything is complete, you’ll boot straight into the boot screen. You can choose the necessary action with your device from here on in.